Slot apps for Android: This category includes mostly free slot apps for Android. All of the apps under this category are only for slot machines - so if you like this type of games, the options we've chosen for you will give you the most fun for months. Android casino games: Casino games are not just slot machines. Card and table games form a category in its own right and offer many options such as roulette, poker, craps, and blackjack. For the same reason, we picked more apps in this category. So what criteria did we use to select the apps? First, we used Google Play Store data: If an application has reached a certain popularity, it means it's worth playing. In other words, the most installed apps are at the top of our lists. However, this is not our only criterion: We also paid attention to the content richness offered by these apps and how fair they are. You can be sure that the apps we chose have a rich content, offer fair gameplay, and ideally balance entertainment and profits. Here are the best gambling applications for Android! Some online casinos offer a separate application for members using mobile devices: These apps have been developed specifically for that casino. A casino app for Android is the official application of that casino site. In other words, every feature in the casino site and the entire collection of games can be accessed from the app. Android casino apps are not your only option to visit casino sites. As a general rule, you can also access them, using your mobile device’s browser. However, using an application allows you to reach more options and get a smoother experience. For example, games within the app have been tested on mobile devices, so they work flawlessly. Since the application has a special interface design, it is easier to access the game collection and other services. In short, if you like to play at online casinos, you should choose native apps as long as possible. Another advantage of such applications is that you can get exclusive bonus offers. Online casinos offer special bonuses to mobile users. Or, they increase the scope of bonuses for desktop users. For example, if a desktop player gets a 50% match bonus, a mobile app user can get the same bonus but 100%. You do not need to be a member to use the casino apps: You can also complete the membership registration directly from the app. The only downside to this is the low number of free casino apps for Android options. Online casino apps offer few games that can be played for free. Most of the collection can only be played for real money. Nevertheless, this is the only type of application that offers the most number of options in terms of content. Main Advantage: Offers an amazing amount of content, all types of casino games are available. In addition, you can get exclusive bonuses. Main Disadvantage: Games that can be played for free are limited. Below, you can see our top picks in this category and their download links & screenshots. Slotomania is the casino app you are looking for. It is the official application of the same named online casino and contains many social features. For example, you can earn cards by playing games and exchange them with your friends – completing a card collection gives you several bonuses and free coins. The application contains 170 slots of different varieties, and it has many mini-games too, such as Snakes and Ladders. If you join the “Sloto Club,” you become a VIP player and get extra games + personal bonuses. In addition, all players can win hourly bonuses. We recommend you to play Vegas Cash, Magic Trixie, and Chili Loco slot games. Jackpot Party app is the official application of Scientific Games, so it contains a lot of exclusive titles. Since the company is the current owner of WMS, Bally, Nextgen Gaming and many other providers, expect to see a lot of slots! More than 200 slot machines are available in the app, and many of them are famous titles, such as Zeus II, Gorilla Chief, Buffalo Spirit, and Reel Rich Devil. The app is focused on slot machines, but there are other game options too, such as bingo and keno. It is possible to find different slot variants, such as fruit machines, jackpot slots, and video slots. Despite many online casino apps out there, Huuuge Casino offers a quite impressive free-to-play game collection. While it is an official app, it is not possible to play games in the app with real money, unfortunately. You can only use virtual coins. However, there is almost no need for that too: The app is generous in terms of free play, and almost all games can be played completely for free, as long as you want. The app offers video slots, video poker, roulette, and baccarat games. Each player can win a bonus every 15 minutes, and daily giveaways are also organized. Double U Casino is an app that focuses entirely on slot machines. Other than a couple of video poker games, the only thing you get is lots of slots. However, the slot collection is quite rich: In total, you can play more than 100 slot machines in different categories. If you are a fan of the Ellen show, you are in luck: Double U Casino is the only app where you can play licensed Ellen slots. These slot series contain lots of jackpots, multipliers, and bonus wheels that award additional prizes. We recommend taking a look at the classic slots collection too, it is quite satisfying. myVEGAS Slots is an award-winning app: It has won the “Best of 2016” award by eGaming Review. As can be guessed, the focus of the app is on slots, but there are other game types too, such as table and card games. The slot collection is quite satisfying in terms of content. This is the only app that offers licensed KONAMI and MGM slot games. In other words, you can play popular slots such as China Mystery, Mandalay Bay, Excalibur, and Lotus Land. The app claims it offers “real awards that are worth 50 million dollars,” but we are not sure what this really means. In any case, you should try the app if you like Konami creations. 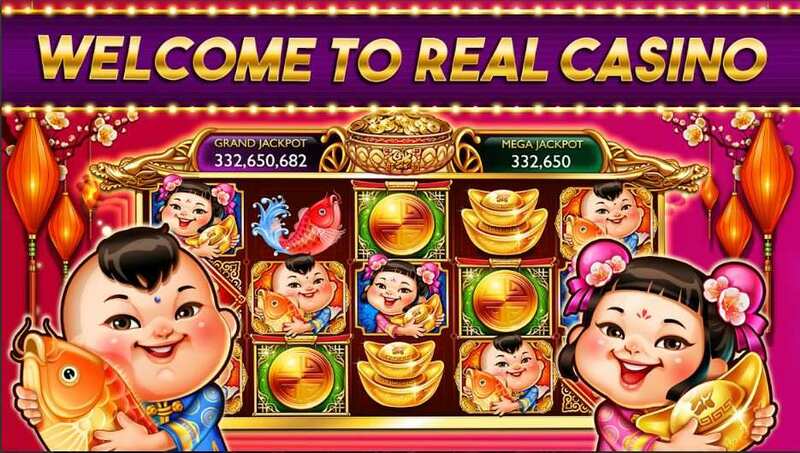 Full House Casino claims to be the “number 1 casino app in Asia,” and we intend to believe it. This is one of the highest rated casino apps available on the Play Store. It is a full featured online casino app with multiplayer features. In other words, it is possible to play card and table games against real players. This is a rare feature and we highly recommend to try it. In addition, the app contains more than 60 slot machines but note that these are Asian-themed titles, so they may not suit your taste. There is also a Megaball Lottery organized every week, which every player can join. You may remember the developer from another app we reviewed. This is the “other” casino app pf Huuuge Global, and it focuses entirely on slot machines. There are a total of 50 slot games in the app, and they all have a different theme. It is possible to play entirely for free: Each player gets free chips every 2 hours. There are also daily goals you can complete, which award more free chips. Players get regular bonuses such as 120 free spins too. Moreover, the app supports offline play, so you do not need a data connection to play the games. Say hello to Huuuge Global again: This time, they are offering a casino app that contains all types of games. Billionaire Casino™ Slots 777 contains slot machines as the name suggests, as well as poker, baccarat, and roulette games. There are more than 100 slots available in the app. All of them are jackpot slots, so if you like this type of games, you are in luck. We highly recommend trying Camelot Cash, Phoenix Garden, Helen of Troy, and Jade Gem Goddess. The app also offers some multiplayer features: You can create a “Club” and play games together with your friends. The most striking feature of Casino Frenzy is that all games within it have multiplayer features. You are still spinning the slot machines alone, of course, but it is possible to play all other card and table games with and/or against friends. By doing that, you can also get various bonuses to use on slot machines too. If you connect the app to your Facebook account, you get 50.000 chip for free. We recommend trying the video poker variants, such as Jacks or Better and Multi-Draw Poker. The slot machines are quite good too, especially if you like jackpot games. Lucky Win Casino heavily focuses on slot machines but still offers a couple of video poker and blackjack games too. You can play most of the card and table games against real players, such as Texas Holdem poker. But the app truly shines when it comes to slot machines: There are a lot of options to choose from, and it is possible to win 1 million chips every day for free. Payouts are quite satisfying too: You can win up to 100 million coins in these games. If you are looking for a casino app that lets you play for free for a long time, Lucky Win Casino will be one of the best options. GSN Grand Casino is all about slot machines and bingo games. The app contains a couple of video poker games too, but the focus is on these two categories. It offers a quite big collection of slot and bingo games – there are more than 90 options available. Moreover, these are licensed and exclusive titles. This is the only app that offers casino games adapted from TV shows: Deal or No Deal and Wheel of Fortune themed games offer a quite entertaining experience. In addition to the welcome bonus, it is possible to win daily bonuses and free chips by spinning a wheel. As the name suggests, this app focuses only on slot machines. There are no other game types available. This is an advantage though: It is able to offer lots of options in different slot categories. You can play classic slots with 3-reels or video slots with 5-reels. There is more than one way to win free coins: daily bonuses, wheel of fortune, hourly bonuses, etc. If you connect the app to your Facebook account, you also get 30.000 coins for free. It is also possible to organize a slot tournament with your friends, so the app has some multiplayer features too. Simple but useful: We can summarize 25-in-1 Casino like this. The app has no multiplayer features, and its graphics quality is quite humble. However, it offers 25 different casino games together and does not require a data connection. This is an impressive content, you can even play exotic games such as Red Dog, Perfect Pair Blackjack, and Craps. The odds are quite similar to real world casinos too. Since it is quite small in size, we recommend downloading this app and using it for practice – all games are 100% free and you can play them as long as you want. Golden Casino app offers only slot machines but lets you play an impressive collection: There are more than 100 slot games within the app, and each one is different. However, most of them are Asian-themed slots, so you need to like this particular category. Each day, a new slot tournament is organized, and winners get free chips. You can also get 200.000 free chips by connecting the app to your Facebook account. Another thing to note is that the app supports offline play – no data connection is needed. So, if you are looking for a slot-focused casino app that lets you play offline, this one may be your best option. Yes, you see it correct: Sugar House Casino app is installed by 27 people only. This is because this is not a “gaming” app. There is a land-based casino in Philadelphia named “Sugar House,” and this is the promotional app of it. In other words, there are no games of any kind in this app. So, what does it offer? You can make a reservation at Sugar House casino within the app or check the events organized in the casino. This app is used for tracking entertainment schedules but it also lets you see the current bonus offers of the casino. Slot machines are the most popular games in casinos. Statistics show that almost 70% of casino revenues are due to slot machines. Regardless of the level of experience, everyone enjoys playing slots: There is no difference between beginners and professionals in terms of chances of winning. There is almost no chance of winning against a professional poker player, but everyone is “equal” when playing slots. Therefore, the Android app slot machine category is quite rich in the number of options. On the Google Play Store, the most numerous options are offered for this category. In other words, these are one of the most suitable applications for casual gambling. Free video slot apps for Android can be used without having to deposit any money. If it’s enough for you to play for a few hours every day, you don’t need to “purchase” anything. However, if you want to play more, you’ll be given the option to purchase a virtual currency with real money. These types of currencies can be used to gain access to more games or earn various bonuses. Nevertheless, as we have explained, it is, of course, possible to play completely free of charge. When choosing from such applications, the variety of games is the most important consideration. Free slot machine apps for Android offer multiple games. For example, it is possible to play more than 50 slot machines by installing a single app. What is important is that these games differ from each other. Ideally, an app should be able to offer different options in classic slots, video slots, and jackpot slots categories. If all games are the same, you will get bored pretty quick. Therefore, it is better to pay attention to two things when choosing slot apps: Game diversity and the scope of free play. For example, if you are asked to watch an advertisement or purchase something every few spins, it’s not possible to have a pleasant experience. When choosing the following apps, we paid attention to these two criteria. Main Advantage: Perfect option for slot lovers – Free slot apps for Android offer hundreds of slot machines in different categories. Main Disadvantage: No other game type is available. You cannot try any other casino games even if you want to. Caesars Slot is the official application of the famous Caesars Casino, Las Vegas. It is developed by the creators of Slotomania, another successful and popular slot app. The app offers more than 100 slot machines in total, with different themes and categories. You can play fruit slots, video slots, and jackpot machines. Some famous slot games are available only in this app, such as Cleopatra, Zeus, Dreaming of Oz, and Buffalo. In other words, the app offers IGT slot collection. A new game is added almost every week. In fact, the latest update added a pachinko machine to the app, so the slots are not your only option. The best part of Scatter Slots is its rich content: The app offers more than 70 different slot games to play. This is quite an impressive number, and new games are added with almost every update. The graphics quality is quite high, so all of the games look impressive. Players can win hourly bonuses which award free coins required to play slots. Each month, more than 10 events are organized, so you can keep winning free coins easily. Moreover, Scatter Slots support offline play: Almost no other slot apps have this feature. In other words, you can keep spinning the reels even if you don’t have an internet connection. Hit It Rich offers two exclusive slots that are not available anywhere else: The Terminator and The Wizard of Oz. Both are among the most popular slot machines at online and land-based casinos, and this app is the best way to play them on mobile devices. We can say that almost all WMS slot machines are available here, which makes it very rich in terms of content. At the time of this review, 12 different slot games were supported. This may seem like a low figure but do not forget that these are highly popular and exclusive games. You can win additional coins for free by inviting your Facebook friends to join the game. Scientific Games is a pretty big group that owns multiple brands, such as WMS, Bally, and Nextgen Gaming. And this is their official slot app, so expect a more than satisfying content. There are multiple slot machines to choose from, and each offers a different theme & variety. You can win free coins every 4 hours by spinning a wheel of fortune. In addition, it is possible to win up to 35.000 coins every day via daily bonuses. The app organizes live slot tournaments on a weekly basis, so that is another event you can join to win more free chips. As can be guessed from the name, Slots Pharaoh’s Way offer a lot of slot machines that use the Ancient Egypt theme. While their theme is the same, you can pick from multiple game options: 5-reel slots, 3-reel slots, 243-payline slots, etc. In this regard, every game feels different and offers a new experience. The total number of games is 20, but all of them are above a certain quality level. If you like Egypt-themed slots, this is the app you should pick. However, note that free play options are quite limited and the app forces you to purchase more coins on a regular basis. Infinity Slots offers 90 slot machines in total, and each of these is a video slot machine with high-quality graphics. The game offers an interesting puzzle mechanism: When you solve the puzzle, you gain a new level and get access to new games. The app does not have any multiplayer features, but you can still invite your friends and compete against them on a global scoreboard. We recommend trying Space Travel, Pirates Gold, and Wild West slot machines. If you join the “VIP Room” of the app, you get additional games such as John Wayne Story and King Kong. However, doing so requires you to pay real money. Hot Vegas Slot Machines contains only 35 slot machines in total but do not worry: All of them are above a certain quality and 2 new games are added every month. The app does not offer the games of a specific provider – it seems Super Lucky Casino developed these slots just for itself. The welcome offer is quite generous and lets you play for weeks without purchasing coins. The app does not offer any multiplayer features, but this is actually an advantage: You can play all of the games even if you do not have a data connection. In other words, it is possible to play completely “offline”. “Slots” is actually the name of a series of apps, all developed by Super Lucky Casino. All of these app offer slot machines of different varieties. This one contains “deluxe” slots: Games with the “richness” theme. The app has 45 games in total, and 2 new games are added each month. Other than the theme, it is almost the same as Slots: Hot Vegas Slot Machines. However, this app is the latest title of the series, so it is updated more regularly. If you cannot decide between the two “Slots” apps, we recommend choosing this one. Again, the welcome bonus will last for months. Game Twist Slots is the official app of Novomatic games, which is a very well-known developer when it comes to classic video slots. Almost all of the Novomatic collection is available within the app – you won’t be able to find most of these games anywhere else. Slots such as Sizzling Hot Deluxe, Lucky Lady’s Charm, Book of Ra, and Extreme Riches can be played entirely for free. The app contains 13 Novomatic slots in total and also offers poker, roulette, and blackjack games. It is also possible to compete against your friends via live slot tournaments. We believe that every slot lover should give this app a go. Willy Wonka Slots is adapted from the movie with the same name, and it is not just a slot app. Sure, it contains a lot of video slot machines, but it also offers casual, Tetris-like games too. There is even a farm you can grow crops and collect. In fact, all of these features are tied in together: You grow corps, win bonuses to use in slot games, and finish other events to get free spins. The app offers lots of mini-games that are tied to the slot games. Spinning the reels requires “Wonka bars,” and you can win these for free by connecting the app to your Facebook account. All games in Jackpot Magic Slots are jackpot machines, as the name suggests. So, if you like to win big, this may be the right app for you. The app contains a couple of popular jackpot slots, such as Money Rain Deluxe and Crazy Money Deluxe. All other games are specific to the app and cannot be found anywhere else. In addition to the welcome bonus, every player gets to open a virtual app every 30 minutes to get more free coins. In addition, you can spin a wheel of fortune and level up to win more. The app does not have any multiplayer features, but it offers the most satisfying jackpot slots collection around. While the developer is Scientific Games, the provider of slot games in this app is actually Bally. In other words, all of them are above a certain quality level. 88 Fortunes app contains more than 40 slot machines, and all of them are based on an Asian theme. So, while it offers a rich content, the app is for Asian slot lovers only. However, even if you don’t like such games, we still recommend giving it a go. 88 Fortunes was a finalist of “Best Casino App 2018,” and it gives free coins every hour. So, you don’t need to make a single purchase to play the games. 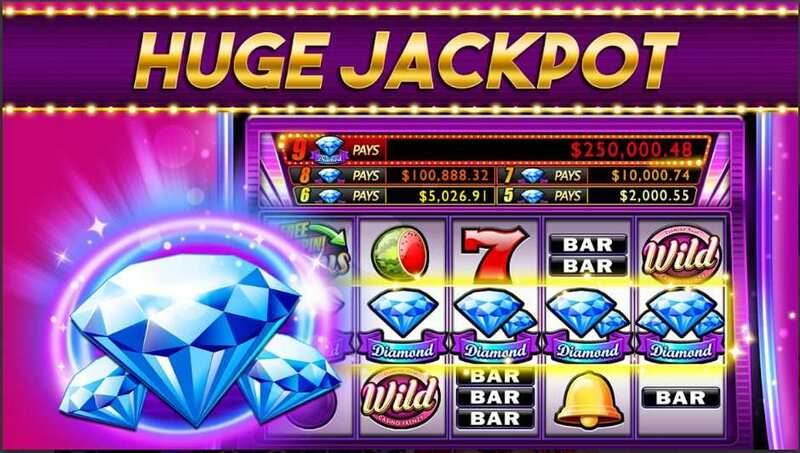 Developer Huuuge Slots offers a lot of apps, and this one is another of them. While it does not have a catchy name, Casino Games – Slots offer a quite big content. The app has more than 50 video slots in total, each with a different theme. Moreover, it has two big advantages: First, each player gets free chips and 120 free spins every 2 hours. In other words, you can play completely for free. Second, it is possible to play the game offline, no data connection is needed. The app does not offer any well-known slots, but the games are still entertaining and fun. Triple Double Slots focuses on a particular category: classic fruit slots. It offers other types of slot machines too, but the majority of the game collection consists of classic slots. If you like this particular category, you can find more than 40 options to play. Payouts are quite good, and there are multiplier games too, that pay up to 15 times total bet. All players can win daily and hourly bonuses – this way, you can earn coins required to play for free. We recommend Triple Double Slots to “old-school” players: There are not many apps other there that contains lots of fruit slots. Slots of Vegas contains slot machines based on… well, the Las Vegas theme, as the name suggests. There are around 40 games available, and they all have a high graphics quality. The app offers no welcome bonuses but this is not bad news: Every 2 hours, each player gets free coins to continue playing for free. Payouts are not bad – the app contains a couple of jackpot machines, and they pay quite a lot. Some of the slots are provided by IGT, such as Wolf Moon and Cleopatra. If you liked these two slots before, now you can play them on your mobile device. As we mentioned above, gambling games are not just slot machines. There are plenty of table and card games you can find in a casino: roulette, blackjack, craps, keno, even bingo. Applications that deliver this type of games in batches can give you an extremely enjoyable gaming experience. The biggest advantage of such applications is that they naturally involve more than one type of game. So if you get bored of playing poker, for example, you can start playing keno: You have quite a few options. However, we recommend that you choose the applications focused on a particular game category. This is because such applications can offer more advanced options. For example, if the multiplayer gaming experience is important to you, you should choose an app focused on a particular casino game. This allows you to play poker against real players, for example. This is the biggest advantage of casino apps: Slot applications and online casino applications consist of games you play against the computer. Pure casino applications, on the other hand, offer the option of multiplayer almost by default. In other words, these are the games which social interaction, and it is a much more fun experience to play against a real player than a computer. As long as possible, we recommend you to choose casino apps with multiplayer support. Use the games played against the computer only to practice and test tactics. Once you’ve had enough experience, start playing against real players and join tournaments! Below, we’ve included both types of casino apps. We’ve also picked the best app for different types of casino games. In this way, no matter what you like to play, you can find a suitable option for your needs. Main Advantage: Multiplayer. You play these games against other people, not against computer software. Main Disadvantage: Actually, none. Pure casino apps are fun for every player and can appeal to different tastes. Zynga Poker is the best poker app android, period. It has a player base of more than 2.000.000. Moreover, it has a global World Poker Tour (WPT) tournament. You can compete against professional poker players and see how good you are. ESPN defines Zynga Poker as “the largest poker site in the world,” and we think the same too. It is possible to find a game going on any time of the day. In addition to the new player bonus, you can win 45.000.000 chips every day as a daily bonus. Both 5-player and 9-player games are supported, but Texas Holdem is the only poker variant you can play. So, for example, if you enjoy 5 card stud poker, there is no such an option. If you are looking for the best roulette app Android, Roulette Royale is probably your best option. The graphics quality is amazing, and the multiplayer option is available. The app offers two variants of roulette (European & American) and organizes tournaments on a regular basis. There is even a global ranking that shows the best players. It also tracks all of your statistics, so you can easily see how successful a particular strategy is. In addition, there is an in-app store where you can purchase fluff items and chips. Roulette Royale can be played solo too, so you can use it to test various roulette tactics and strategies. With a 4.9 rating, Blackjack 21 seems to be the best blackjack app for android. However, we must mention that the high ratings may be due to the bonus chips offer: If you give a 5-star rating to the app, you get 10.000 free chips. Nevertheless, Blackjack 21 is quite a good and more important, “clean” app. It does not have any hidden purchases or locked features available only to paying players. The graphics quality is quite nice, but the game interface is only available in vertical – so you cannot play this one on tablets. The app uses classic Las Vegas blackjack rules, and only one variant is available. We recommend using this app to test various tactics and strategies. There are not many bingo apps for Android but don’t worry: Bingo Blitz is the only app you need. In fact, it is the most downloaded bingo app of all times. There are a lot of bingo rooms with different themes to choose from. Multiplayer is supported, so you can play with other players. Bingo tournaments are regularly organized, and there is even a global ranking list. Every player can win daily bonuses (free coins and credits) to play any of the rooms, which have different betting limits. The app even offers a “single-player story”, which awards more coins and credits. You can also spin a mega wheel every day for additional prizes. Yatzy Classic is the best craps app for Android if you like “offline” play. Almost all the games require you to have an internet connection to work, but this is not the case for Yatzy Classic. You can play it even if you do not have a data connection. As can be guessed from this explanation, the game has no multiplayer option. However, this is not a disadvantage as offline games are rare. (If you want, there is also another app from the same developer that offers multiplayer.) American and Standard variants of Yatzy are supported, and there are no “in-game purchases”. This is another big plus: You can play as long as you want, no currency is needed to play. Absolute Keno Free is the most advanced keno app for Android. It supports both offline and online gameplay. You can get free coins every 4 hours – so if you are patient enough, there is no need to purchase any coins to play. This is the 80-number variant of keno, and you get to pick 20 numbers at every game. The payouts are quite high, and if you purchase “lucky red powerballs,” you increase your chances of winning. Real-money gambling is not supported, but Absolute Keno Free has enough content that will last for months. By completing daily goals, you can win additional coins. There is also an achievement system which also awards free coins. If you are looking for a nice and clean baccarat app for Android, this one is your best bet. Baccarat Online 3D offers impressive visuals before anything else, as the name implies. However, the best part of the app is multiplayer: You can invite your friends and play together or compete against other players. Baccarat is a game that should be played against real people, and this app offers you this opportunity. There is a global scoreboard, and the top players receive personal bonuses to use in the game. In addition, there are a total of 6 different bonuses to choose from. It cannot be played offline, but baccarat is not meant to be played against a computer anyway. Video Poker Offline Free is the best option if you are looking for an app that can be used for practice and/or completely casual gambling. The app requires no data connection, as the name suggests, and works any time because of this reason. You can play it even when your phone is in plane mode. It contains three video poker variants: 5 card stud poker, jacks or better, and deuces wild. The payout rates are satisfactory, and the visuals look very pretty. The app can help you learn how to play poker too. It has no bonuses (or multiplayer features), but every mobile gambler needs a good offline poker game to play, and this is the app you can use for that purpose. Blackjack 21: Blackjackist may be the most advanced blackjack app available on the Play Store. First of all, it has amazing graphics quality. We recommend playing on a 5.5 screen – visuals look really good. However, this is not the only distinctive feature of the app. It offers multiplayer features and allows real players compete against each other. In addition, the games played against the computer are RNG certified – you always know they are fair games. No registration is needed to play the game, just download and install. If you are a blackjack lover, this app offers everything you need and more. Blackjack 21 Pro is an app that focuses on social features. It has a big player base and offers multiplayer matches against those players. In other words, you can take part in 1v1 blackjack tournaments. It is possible to play against the “computer” too, but we do not recommend that. Playing against a real person is more fun and enjoyable. There is a VIP Club you can join to get access to more tables, but this is not an important feature – all blackjack games are the same, 4 players competing against each other. All players can win free chips every day, as well as daily and hourly bonuses. Blackjack 21 HD is a pretty simple game. It has no multiplayer features nor social interaction. The app is very small in size, and all it does is allowing you to play classic blackjack against the “computer”. This is not a bad thing though: It works offline and offers quite pretty graphics. The game uses the standard rules of blackjack, so there are no side bets/bonuses. This means you can use Blackjack 21 HD for practice and test tactics. It does not require any kind of payment, so you can play completely free of charge. We recommend this one to those who are new to blackjack. Remember the Blackjack 21: Blackjackist app? This one is from the same developer, and it is about roulette. The app offers the same features as Blackjackist: It has multiplayer feature which allows live tournaments and games against real players, and an RNG certified system that lets you check the fairness of the games. Three roulette variants are available: European, American, and French. You can keep winning free chips every day. Note that your chip balance can be used on all games from this developer. So, you can win at Blackjackist and spend on Roulettist, for example. At the moment, we think that this is the most advanced roulette app on the Play Store. Abzorba Games is a developer that focuses on social aspects of casino games, and Roulette Live is no exception. As the name suggests, this app allows you to play with real people around the world. In fact, each roulette table can host 6 players in total. Don’t worry, if real players are not available, the app fills the spots with “bots”. Only two variants are available within the app (American & European), and there is a special feature to test various tactics. So you can pick from a list of roulette tactics and see whether it really works or not – this is the best feature of this app. Roulette Casino Style is a simple app. It has a 2D interface and supports both American and European variants. The graphics quality is not bad but it does not look pretty either. The app has limited social features. Other than a global scoreboard, there are no multiplayer features – which means you can only play against the computer. However, offline gameplay is available, and you can keep playing without spending a dime. We recommend using this app to learn roulette and test various strategies to see they really work. Other than that, pick another advanced roulette app on the Play Store: This one lacks “modern” features, unfortunately. This one may be the most popular holdem poker app on the Play Store. It has a user base bigger than 1 million players and supports multiplayer gaming, so you will always be able to find a poker room to join, no matter the time. As the name suggests, the app is for holdem poker only, but all games can be played against real people. Various variants of holdem poker are supported, such as in/out, cash-ring, and fast fold. Building a friends list is recommended, as friends can send each other poker chips, which are required to join rooms. Live Hold’em Pro Poker is an advanced app and you should definitely give it a go if you are interested in this variant of poker. As you probably know, World Series of Poker (WSOP) is the biggest and most famous poker tournament in the world. Well, this one is its official app. Unfortunately, its multiplayer features are limited. You can play poker games against real players, but the focus of the app is a single player experience. The content is quite rich: There are various tournaments you can join, and lots of variants to play such as Texas Holdem and stud poker. The single player part of the app is near perfect, and it records your data too: You can check how successful a particular strategy is. If multiplayer is not that important for you, WSOP is the best poker app you can play. Dragon Ace Casino – Baccarat has an interesting story: You play as an owner of a casino and try to win baccarat games against other players. The more game you win, the more money you save. In other words, the game has a basic but fun story, which allows you to gain free chips as you progress. The app has multiplayer features, and it is possible to play against other players in your friends list. The playing speed can be adjusted, and the app records detailed data about your gameplay & performance. As far as baccarat apps go, this one is quite advanced and offers all the necessary features. If you are looking for a very simple baccarat game you can play offline, Baccarat – Royal Online may be a good option. This is a very basic and simple app that uses a 2D interface. The graphics quality is not that good but enough for a card game. The only option is to play against the computer, there are no social or multiplayer features. Unfortunately, the app does not have a “history” feature too, so you cannot view the results of previous games. Baccarat – Royal Online lacks a lot of features that the other apps have but it is still a nice option to learn how to play baccarat and test a couple of strategies. If you are looking for an exact replica of video poker machines in land-based casinos, Video Poker seems to be the best option. It does not have multiplayer/social features, and its graphics is not that pretty. However, the app contains 14 video poker game variants in total, such as Tens or Better, Deuces Wild, Joker Wild, and Double Bonus. Moreover, it is completely free to pay. There are no in-game purchases at all – none. Play as long as you want without a limit. Lastly, the game can be played offline. Video Poker may be a simple game, but it contains all the necessary features for a fun gameplay. Video Poker Casino offers three poker variants: Joker Poker, Jacks or Better, and Deuces Wild. It has cartoony graphics, and for some reason, portraits of superheroes are used for game symbols. There is no multiplayer, but you get a leveling system: With each game won, you gain XP points and levels. And with each level, you get free casino chips to play. Unfortunately, when you hit the end level, the number of free chips decrease quite a lot and you are forced to purchase them. Nevertheless, until you hit the end level, Video Poker Casino offers an enjoyable journey. American Poker 90’s is a great game if you are an old-school player who played on these machines during the 80s. But if you are looking for a video poker app with high-quality graphics and more than one game, it is best to look elsewhere. American Poker 90s only have one game and its graphics are kind of “terrible” according to today’s standards. This is intended, however: This is a retro game that emulates an 80’s video poker terminal with the same name. It is played with a single deck of cards and offers 8-bit sounds, so it is really for old timers. However, it does not have any kind of ads and can be played completely offline. If you are looking for all the video poker variants out there, Video Poker Classic Free really contains all of them. There are 39 different types of video poker within the app and some of them cannot be found anywhere else; such as Aces & Faces, 2 Ways Royal, Ultra Bonus Poker, and Loose Deuces. We don’t think even land-based casinos offer these games anymore. The graphics quality is not that good but looks authentic. The game can be played offline and used for training, it even offers some tips to improve your gameplay. If you are looking for the “ultimate” video poker app, this one will be the best option. BINGO! Contains 35 free bingo games in total. The most important feature of the app is “offline” gameplay: You do not need a data connection to play any of the games. Standard bingo rules apply – each ticket has 25 numbers on it, and you are trying to fill all the rows to make “bingo”. 75 numbers are used during the drawing. It is possible to get free chips every day as a bonus, and if you are playing casually, these will be more than enough. Note that the game has a quite fast gameplay, all drawing end in seconds and you can complete all 35 games in an hour or so. If this is not a problem for you, BINGO! is a nice app. Bingo Pop offers a lot of social and multiplayer features. There are 15 different rooms to play bingo, and each of them supports multiplayer gaming. So, you can play with your friends and other players. With each game played, you gain a level, and there are 900 levels in total. With each level, you get different perks and bonuses, such as more free coins to play. The app also has an offline mode, so a constant data connection is not mandatory. Bingo Pop keeps you entertained for a long time and gives you personal goals to reach, such as collecting cards and opening up treasure chests. This one will keep you busy for a long time. Multiplayer features are the strongest part of Bingo Party: 10.000 real players can play at the same time. There are a total of 30 bingo rooms you can join, and each one is filled with real players, just like you. This is also one of the rare bingo apps that give a welcome bonus. With the 500 free tickets, you can play for a long time completely for free. You can also win more free tickets on a daily basis with the help of other bonuses and daily tournaments. The app also offers a simple story to follow, and as you progress the story, you get power-ups and more free tickets. If multiplayer features are important to you, this is the app to play. Free Bingo Games do not have a welcome bonus, but every player gets free coins to play every 4 hours. So if you are a patient or casual player, you do not need to spend a dime to play all the games. You can play up to four tickets, and each one costs 20 in-game gold. The app has no multiplayer features but this provides an advantage: It can be played completely offline, no data connection is required. In addition, you can change the speed of the game and instantly reveal all the results, for example. Free Bingo Games should be installed to your mobile device as it offers offline gameplay, but if you are looking for a multiplayer bingo app, this one is not it. As the name suggests, this one is the classic Yatzy, so it is not exactly a casino game. However, it offers the same gameplay and rule set we are used to from the table game. Each game is 13 rounds and each round you roll the dice five times. There are 13 combinations of the dice, and the goal is reaching the highest possible score in total. The graphics are pretty, and the app offers some multiplayer options. You can play a game against your friends or other real players. However, solo play is also possible – this mode teaches you the basic rules of the game. This app is probably the best craps game out there if you are looking for an authentic casino experience. Even the game table looks authentic – the app gives the illusion of playing in a real casino. There are no multiplayer features, which is a disadvantage, but Craps – Casino Style has two important things: First, it has a “training” mode, which teaches you the game and tells about the basic strategies. Second, you can play it offline. The game also keeps track of your performance and lets you improve your gameplay in the long run. If you are looking for an app to learn how to play craps, this one is the best option. Craps started on the streets, and this app lets you play that version – Street Craps. It is quite different from the casino version: The gameplay is more dynamic, the betting options are less, and the game feels faster. The graphics quality is quite satisfying as the entire game is in 3D and real dice physics are used. However, the most important feature of the app is voice communication. That’s right: It has multiplayer features and players can talk among themselves, no matter where they live. This is the only craps/dice app that offers a feature like this. We highly recommend trying it. If you ever played a Keno game in a Las Vegas casino, this app offers almost the same experience. Your goal is hitting 10 out of 10 numbers – doing so results with the highest prize available: 1.000.000 credits. Hitting 9 numbers in total awards 500.000 credits and so on. There are a couple of rooms you can join, each with a different theme. The app offers no welcome bonuses, but each player can spin a wheel of fortune every day and win free credits. The graphics quality is quite nice, and the game offers the option to auto pick numbers. If you liked Las Vegas Keno Numbers Free, you will like Luck Keno Numbers too. We are not exaggerating they really are the same app. Same graphics, same options, same games… It seems Gurkin Apps and Binko Apps are the same developers, or someone stole the game from other. Well, there is one difference: Lucky Keno Numbers contain one less keno room. Other than that, no difference. Both apps are quite new on the Play Store, so this may be an attempt to attract attention, we are not sure. In any case, if you have to pick one, we recommend going with Las Vegas Keno Numbers. This is a classic keno app: It has no multiplayer features, a 2D interface, and the usual 80 number drawing system. These are not bad things though, especially if you think it can be played offline. No data connection is needed. Moreover, almost no payment is needed. Every player gets a lot of free coins every day, you do not need to make a single purchase to play. Unfortunately, this has a cost: The app has too many ads. If you can overcome this problem, Keno Games Offline is a nice game to install that allows you to play classic Keno whenever you want, wherever you want. 0 responses to "The Best Casino Apps for Android – Mobile Gaming Guide Slot"